The Vancouver Canucks have struggled in the past few seasons and their problems have primarily stemmed from their lack of scoring. The Canucks finished 29th in the NHL in goals scored last season with only 178, averaging a meager 2.17 goals-per-game. This problem can be traced to a lack of firepower among the forwards and relying too heavily on the fading Sedin twins. 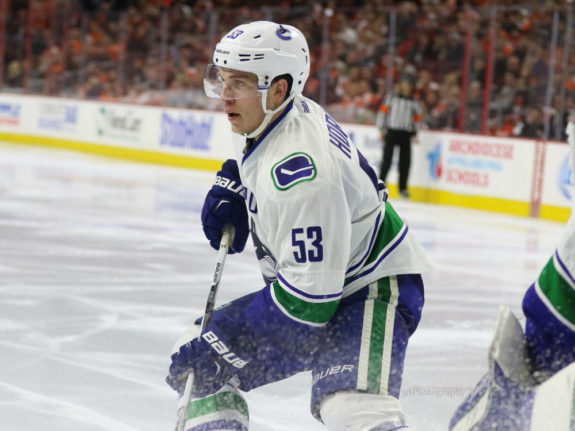 As the Canucks gear up for a rebuild, a larger share of the spotlight will be shifting to the young guns such as Bo Horvat, Sven Baertschi, Brock Boeser and Ben Hutton among others. As the roles of some veterans start to diminish, the up-and-comers will need to step up and fill the void. One can only speculate as to what the Canucks’ first line will look like when the 2017-18 season rolls around but I firmly believe it will look very different. As I’ve touched on in a previous article, Daniel and Henrik Sedin are just not first line players anymore — the twins combined for 94 points last season which doesn’t sound terrible but in comparison to other teams’ first line production, it’s below average. For example, Jamie Benn and Tyler Seguin of the Dallas Stars combined for 141 points and the Stars finished only 17th in League scoring. However, 94 points on the second line would be a very solid number and that is where the Sedins should be at this point in their careers and as it fits with the Canucks’ trajectory. Less ice time and a smaller workload could be the perfect recipe to get the Sedins back on track and doing what they do best. It’s time to pass the torch and make way for the new-school — speed, skill and youth. 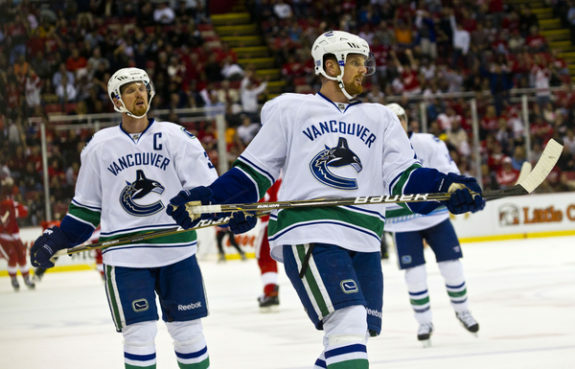 The Sedin Twins sliding down the lineup creates a void that needs to be filled and an opportunity for the future of the Canucks’ organization. I’d look no further than Horvat to take Henrik’s spot at center and for Baertschi to assume Daniel’s spot on the left side. Last season, Horvat tallied more points than both of the twins with 52 and finished first in team scoring with 20 goals. He was the face of the team last season and I’d expect a much larger role for this rising star come next year. 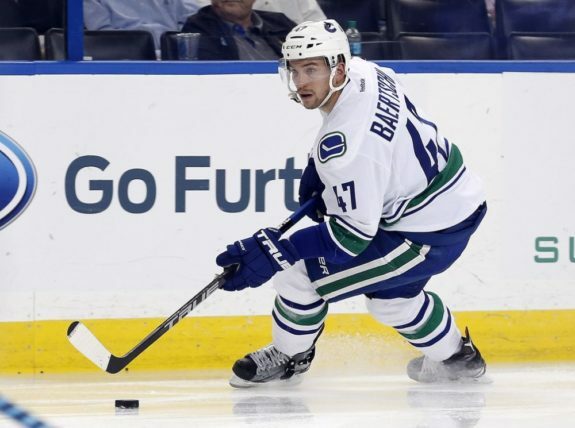 At left-wing, Baertschi could easily assume a first line role. Coming off of an 18-goal season, he finished third on the Canucks in goals and based on his growth as a player, he can be expected to notch 20-something goals in the coming 2017-18 season. Finding a suitable right-winger to skate on the first line is a tad more difficult but there is a handful of players to select from, the front-runners being the aforementioned Boeser, Loui Eriksson and Markus Granlund. Yes, Granlund is a natural center but with the recent addition of Sam Gagner to the rotation, somebody is going to lose their spot down the middle. Granlund is on the smaller side and finished second on the team in goals with 19, so I think he’d make a decent fit on the wing. My personal choice would have to be Eriksson, an 11-season veteran and two-time 30-goal scorer, he could add some more firepower and some veteran stability to a young first line. He’s coming off of a very disappointing season that only contributed an ugly 24 points but hey, the entire team is coming off of a disappointing season. The last possibility is Boeser, a 20-year-old youngster who has played a grand total of nine NHL games that he scored a not-too-shabby four goals in. Boeser is a natural right-winger and a proven offensive weapon. 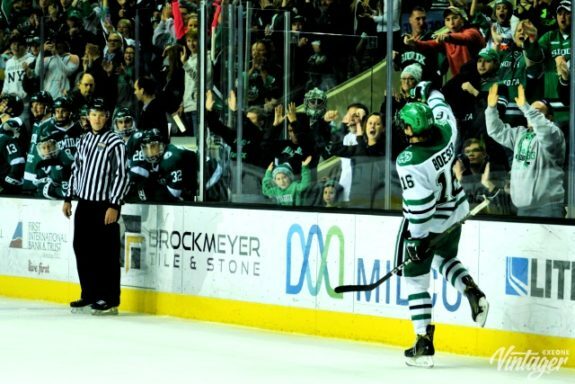 With the University of North Dakota in the 2015-16 season, he rippled the mesh 27 times and added 33 helpers in just 42 games. I like Granlund slotting in on the third line, Boeser gaining some experience and valuable tips from the Sedins on the second line and Eriksson on the first line hopefully rising to his full potential. Depending on the play of Eriksson and Granlund, I’d peg them as interchangeable on the first and third.